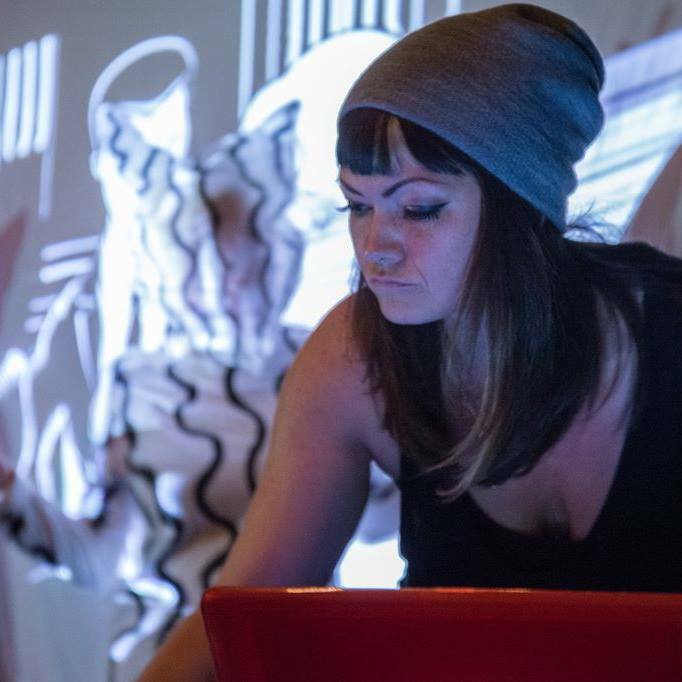 Portland based electronic music artist, NeveroddoreveN (Heather Tucker) is early in her career as a solo artist but already turning quite a few heads with her original work and live show. Her work can be classified as dark wave and synth pop, drawing inspiration from notable industrial and postpunk synth bands of the 80s among others. She is a talented and expressive vocalist and her live performances are known to feature live video projections and dancers as well. Femmecult got a chance to pick her brain on her creative process and that gnawing feeling one gets when creativity becomes stagnant. Femmecult: Where are you from? NeveroddoreveN: I was born in a tiny town in Texas near the border of Louisiana. But I grew up in Houston, TX from the age of 2. Femmecult: What is your musical background? How did you get started? NeveroddoreveN: I am not formally trained. I’ve had no schooling in music. I was mostly a vocalist up until about 2 years ago. After being in a handful of bands from the age of about 22 I decided to go it alone. I find that working with others can be a lot like being in a relationship. You like someone more than they like you or vice versa. I was either looking for a way out of whatever band or completely heartbroken when whatever project didn’t work out. Not that I’m against collaborating now but it’s so much easier to answer to yourself with artistic endeavors. Also, I’ve never been less stage shy than when it was just me…..representing what I want to make…..from start to finish. Believing in it more. Standing by it, you know? Femmecult: Please comment on your musical style. NeveroddoreveN: Downtempo dark synth? Electronic droneloop sample? I never know how to classify it. Most of my tracks have a dark and sad undertone. I’m drawn to dark music. I could give it a made up name with all sorts of electronic sub genres connected together but that would be annoying. I throw melodies together with synth sounds and sing over it. I make what I would want to listen to. And in my most formative years really enjoyed 80’s dark synth pop and industrial stuff. Throbbing Gristle, Severed Heads, Depeche Mode, New Order, Gary Numan. I’d like to think it has inspired what I produce today. Femmecult: What have you gained from your creative and artistic endeavors? NeveroddoreveN: It has saved me from heartache, sadness, madness, depression. There’s nothing as rewarding as creating. Femmecult: What motivates your work as an artist? NeveroddoreveN: I’m motivated by a feeling of complete and utter discontent when I don’t spend time making music. I get uncomfortable in my own skin if I’m not creating. If I go through an creative “dry spell” I panic. I think, “Well, this is it. I’ve lost my mojo. Shoot me like a dead horse.” It’s rather pathetic and full of self pity. I think plenty of artist’s do this to themselves and it’s tragic that anyone have to suffer this way. But the rewards…..Oh, the rewards. Femmecult: Please talk about your creative process. NeveroddoreveN: I observe, observe, observe. I listen to music and albums I like over and over again. In some ways I try to duplicate sounds and song builds from artists I really admire. (After all, art is plagiarism, right?) Luckily I’m not very good at it and I don’t research how such and such got their sound or what equipment blabbity-blah is using. So what I make ends up sounding like my very own. My favorite part is the build of a song. The layers and how they present themselves is a source of constant fascination to me. Femmecult: What have been some challenges you have faced as an artist? NeveroddoreveN: That stuff about the self deprecating creative slump I mentioned before. Also it’s taking time but I’m learning that it’s OK if someone doesn’t “get” my music. I DO wish that there were 2 of me. One to do the business-y promotional and financial stuff and one to just produce and play. I don’t like the sordid details of booking and promotion. Also, I can get sort of a rut with wanting to spend the time to learn new equipment and/or software. Learning Ableton Live made me want to murder butterflies with a torch. New hardware also intimidates me. Thank God for youtube tutorials. Another thing is that I’m very unorganized, say with like files on my computer. I was getting my live set together recently and I was searching for a song I had previously recorded and I had since renamed it. I couldn’t remember what file I put it under nor what the original name was. I finally found it much to my relief and did what I had to do. Did I rename it and move it so next time it would be easier to find? Nope. I’m a mess. Femmecult: What has been your evolution of musical creativity to this point? Name some of the highlights. NeveroddoreveN: The biggest evolution has been learning more each time I sit down to make a song. This is also the highlight. Femmecult: Do you think visual art informs sound and vice versa? If so, how? NeveroddoreveN: All of my favorite directors use a well-placed score. I think it’s quite relevant and necessary for good filmmaking. I also think that an entertaining video is important to match a great song. I have no idea if I’m answering this correctly. Haha. But this is how I think visual art and sound cohabitate best. Femmecult: Do you have other forms of creative expression besides music? NeveroddoreveN: I like to sew and design clothing. Femmecult: If you perform live, talk about how you prepare. Does your setup change from show to show? NeveroddoreveN: I’ve only had one performance as a solo artist so far. The process was very different than when I’ve performed with bands in the past. But practice makes perfect. I listen to my songs over and over again and condense my live setup in a way that isn’t too complicated or busy in a live situation because I spend a lot of time singing during a set. This also makes for less room for error. Also, I enjoy creating a nice visual experience with my live set. I’m into making costumes and having dancers and projecting film while I play. It’s nice to see your own ideas that you have swimming around in your head come to fruition. Femmecult: If music can be considered a language, what is it you would you like to communicate with your work? NeveroddoreveN: I guess I would say that we are all imperfect and we all hurt but there is beauty in the dark and we will all be ok.
Femmecult:Talk about the lyrical content of your songs and speak to your editing process. What kinds of subject matter to you draw from? NeveroddoreveN:Lyrical content can be such an afterthought sometimes that it almost seems like it comes from this weird subliminal place. It’s strange for me. I usually hum out a cadence first then plug in words that seemingly fit. When it’s all said and done the words usually fit some sort of thing I’m going through at the moment. Except for my song, “Sundial.” I just wrote down key words that I thought sounded cool from the pages of a fashion magazine. Femmecult:How do you go about arranging a song from start to finish? Do you start with a drum loop or a melody and then add your voice? NeveroddoreveN:Quite honestly about 70% of the time I will start with a bassline. Probably because that’s so fun for me. Drums are a close second. I’m challenging myself lately to make more traditionally structured compositions. The drone-y loop stuff is fun too but I think the formula of the former is easier for a listener to enjoy. My process is evolving a little bit and I’m always learning. But a constant for me is that I always record the vocals last. Femmecult:What do you envision for the future of this project? NeveroddoreveN:The future? Make beats until I’m deaf and/or dead. Ha! So it’s not just me that thinks they’ve lost all hope of ever creating anything worthwhile again when they have a creative slump. Okay then! Also this: “Learning Ableton Live made me want to murder butterflies with a torch.” LMAO.